While browsing the internet this morning I stumbled on an amazing blog by Aryz Eden Sky. It is on her site that I found this poster. I don’t know it’s origin. But I wish I could find a full size version for my wall. The mantra on it simply sums it up! The welfare of the planet is in our hands, NOW! It’s all we have to do folks. 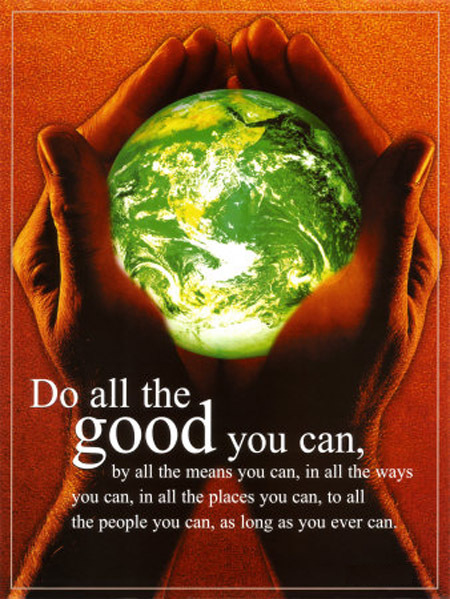 For ourselves, for each other, for our planet…All the good we can! Maintain an attitude of awareness that all that you do has bearing on everything else, and that eventually all that you think, and all that you are will join with other like minds and bring about the changes we desire. What is truly in your heart will be made manifest. The earth and all her species, our environment, human consciousness, world economies and governments, health, you, me and our children are all going through the same changes. We are currently all more dead than alive. Everything sits in a precarious, vulnerable state, waiting for something to lead us forward. But we’re it! We are what we are waiting for. Within each of us glows the only answer that is needed. It’s time for us to serve each other with goodness, kindness, and compassion. You only have to go to your own heart for the inspiration that will guide you. Our most precious jewel, that warm glowing transmitter/receiver sitting in the centre of your own chest is attuned to the green jewel that is earth. As you love yourselves and one another, and endeavor to demand respect for yourselves so will the earth be respected. All outer change will start within you. As Gandhi said ” Be the change you want to see” and never before has this been as needed as now. The evolution of human consciousness demands it. In 2011, live as though you are the keeper of the most sacred jewel ever discovered, for in truth you are. Your heart has the unparalleled power to generate vast amounts of life-giving energy. Be brave enough, kind enough and generous enough to share the energy in any and every way possible. Hold nothing back and watch the bounty flow throughout all of creation! More such unselfish contributors and the community would surely become a more productive environment for all of us. LOL Dolores; that’s so funny! – Interesting though that you find it stirring if not comprehensible. I would be happy to further elaborate on anything I may have not explained well. Thanks for reading though! Thank you for writing this stirring article, do not fully understand it but enjoyed reading anyway.